My bracelet is progressing, slowly but surely. Originally, I was going to add one coin shaped pearl but I loved their shape and color so much that I decided to add 3 of them. You can see how it doesn’t grow in an even way. Just like life where we will focus our attention to certain parts, my bracelet is growing more on one side than the other. As I go with the flow of the beads, I will feel a pull to work on one particular part and help that grow. Then I will notice the gaps in the other parts of the bracelet and move over to those places to seek balance. 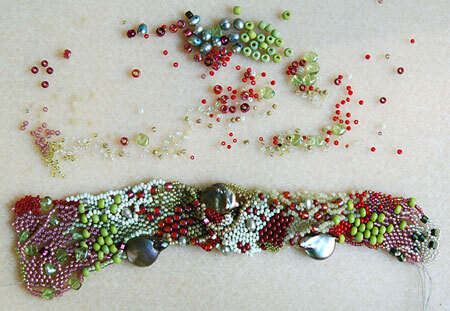 As the bracelet grows, I am still working in peyote stitch here and there but find myself adding whole loops of beads to create bridges to other parts of the bracelet. As in life, flexibility is key as you listen to your inner voice to see what the next step should be. I’ve been read a fascinating book called “The Kaizen Way: One Small Step can Change your Life” by Dr. Robert Maurer. Kaizen is a Japanese technique using small, steady steps to achieve lasting success with a goal. You can read more about it and Dr. Maurer here. There is a part of our brain, located in the midbrain and called the amygdala, that is crucial to our survival because it controls the fight-or-flight response. This response is a natural alarm that alerts certain parts of our body for action in the face of immediate danger. When the alert happens, other parts of our body are slowed or shut down to allow all of our energy and resources to get us out of the danger. One nonessential (at the time) function that shuts down is our rational and creative thought processes. Even though most of us aren’t in situations where a dangerous animal is charging at us, this response is appropriate and vital in our lives today in emergency situations such as someone breaking into our house or reacting to a driver who has run a red light and threatens to hit our car. Where it can create a problem, however, is when we are faced with a new situation that is not part of our usual, safe day-to-day routine, such as the challenge of finding a new job or quitting a habit such as smoking or overeating. This situation can trigger fear and the fight-or-flight response can be triggered from our fear which will then shut down the thinking part of our brain. Big goals can trigger fear also. So, taking very small steps towards a big goal or new situation can bypass those fears. With each small step, new neural pathways are laid down in our brain and we build new habits, working towards our goals and a new situation in a comfortable way for us. So, what does this Japanese technique have to do with creating a freeform bracelet, you ask? As I’ve read different comments from my readers about their experience with freeform peyote, I’ve heard that this kind of project might feel overwhelming, especially when it is such a free flowing creation. There really isn’t an exacting set of instructions regarding what to do. 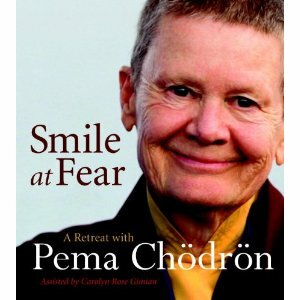 So, I suggest to fool that fear response and accomplish this creative task with teeny, tiny steps. 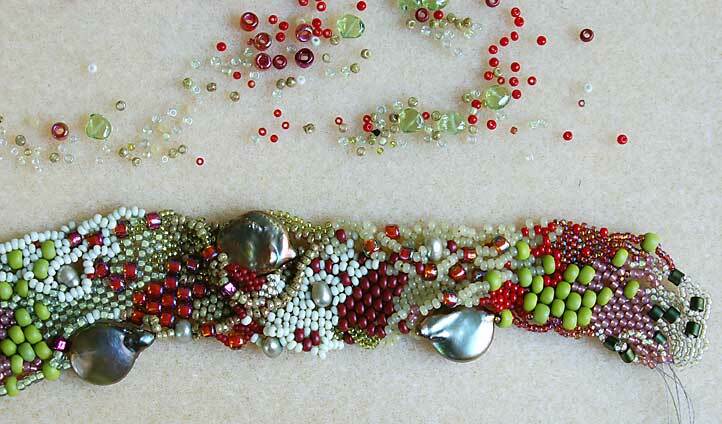 Set aside 5 minutes a day to add a couple of beads at a time. Put a little sign next to your growing creation that says something like, “whatever I create is beautiful”. There is no right way or wrong way. Whatever you create is a beautiful expression of you, one tiny bead at a time. This entry was posted in Beads, Color, Creativity, freeform peyote, Jewelry, Life Musings, Photography and tagged bead weaving, freeform bracelet, freeform peyote, freeform peyote bracelet, seed beads. Thanks Dora for your kind comments about my bracelet! Yes, one small step at a time and, before you know it, the bracelet is finished. This is a wonderful approach to finishing any project, I think. Yes, I agree, mind, body and spirit, all connected, one to the other. This is becoming something rather special, Karen! Karen, that bracelet is BEAUTIFUL. Also, that book sounds fascinating. I try to incorporate that into my life, especially since the whole concept of a HUGE change is so dramatic and overwhelming. I also think small changes are more likely to be lasting changes. Anyway, I think I might get that book. Thanks for mentioning it! Thanks Amanda! Yes, it’s a great book with a lot of good sound advice and tips on working towards overwhelming goals. I recommend it very highly! Awesome. Freeform is my fav! I was wondering how you would direct someone like me who has absolutely no experience in beading but would be interested in learning. A beginning beading class at a arts/crafts store? A book with instructions? I have no idea where to start, but I’d love to give it a try. Karen, thanks for visiting my blog. I am glad people are happy for me finishing finally. I love how this group supports each other. Your writing here has just hit home in a big way as my grandson just sort of shut down yesterday. He’s had a lot of trouble in school as he is severely ADHD but since he is so well behaved the schools have had trouble believing it. Yesterday things changed a bit as he refused to go to his typing class and was ready to quit school (ninth grade) if that’s what he had to do. He is kind of having a phobia/fear problem walking into that classroom. I would like to copy your writing here to send to my daughter as little steps are what he needs (and what the school promised this year – they’ve been fighting the schools since kindergarten). May I copy your paragraph? Your bracelet is coming along really nicely. I may finally pull some beads out to start one. I like your idea of just adding a few beads here and there and see where it leads. I was happy to visit. Your BJP pieces are beautiful. I’m looking forward to seeing your creations for the 2008 BJP. Yes, please do share that info with your daughter. I hope it helps.